The digital calipers I bought from Banggood are the most expensive part in this pile of relatively cheap items. They’re one of several variations of the same model, priced somewhere in the mid-range compared to similar no-name brands. I mainly bought this particular version because it’s made of stainless steel, instead of plastic like the cheaper models. It also comes with a plastic case, and an extra battery in addition to the one that’s pre-installed. The english instructions are a nice touch, but not really necessary for a device with three clearly labeled buttons. Both the mechanical and digital features are similar to what you’d find on any of the more expensive name-brand calipers. Of course you can’t expect the same build quality on a $10 piece of equipment as a $150 Mitutoyo, but for hobbyists these are more than adequate to start out with. 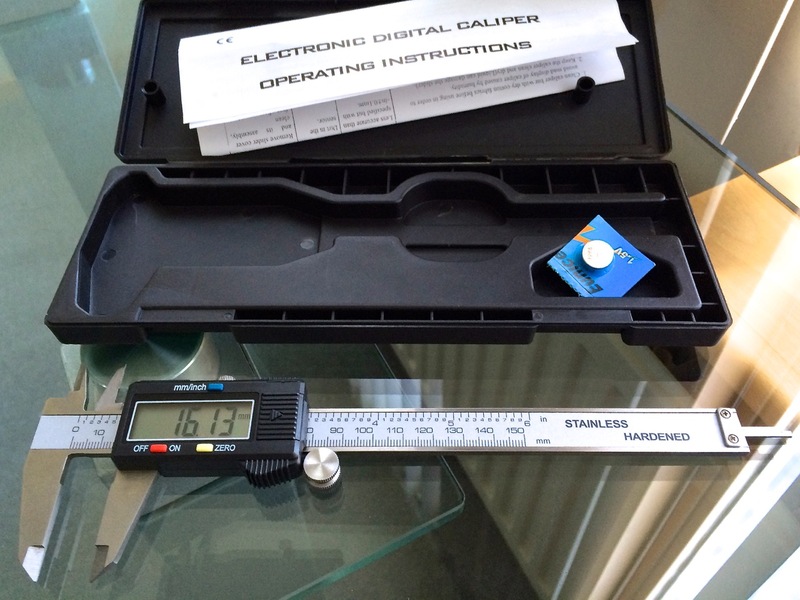 The calipers can be switched between metric and imperial units, displaying inner, outer and depth measurements in millimeters or inches with two decimals. The zero button resets the display to 0 to recalibrate it when it’s fully closed, or measure the distance relative to an earlier measurement. The on/off button switches off the display, not the entire device, which may have an effect on battery life. When you’re working with tiny surface-mount components smaller than grains of rice, fingers are completely useless for placing and holding down parts. That’s where tweezers come to the rescue. I wasn’t sure which type I would feel most comfortable with, so I ordered a set of 4 different kinds. 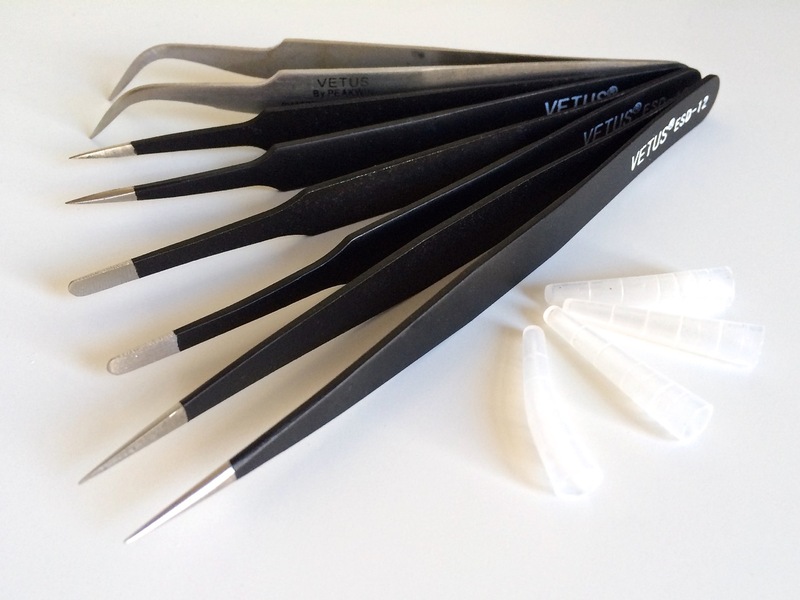 These steel tweezers have a non-conductive coating, adding a bit of ESD protection. Unfortunately something went wrong during Banggood’s order picking, and they sent me the wrong model curved tweezers, without the coating. After contacting them to ask for a replacement, they offered to refund the entire order as an apology. So far I’ve used the long needle point tweezers for all of my surface-mount work, placing and holding onto components with one hand, while soldering with the other. I’ll probably switch to using the curved point ones after I order an ESD-safe replacement. As you may have read in my previous posts, I ordered a few SO-8 to DIP-8 adapter boards a while ago, and used them to solder my first surface-mount part. 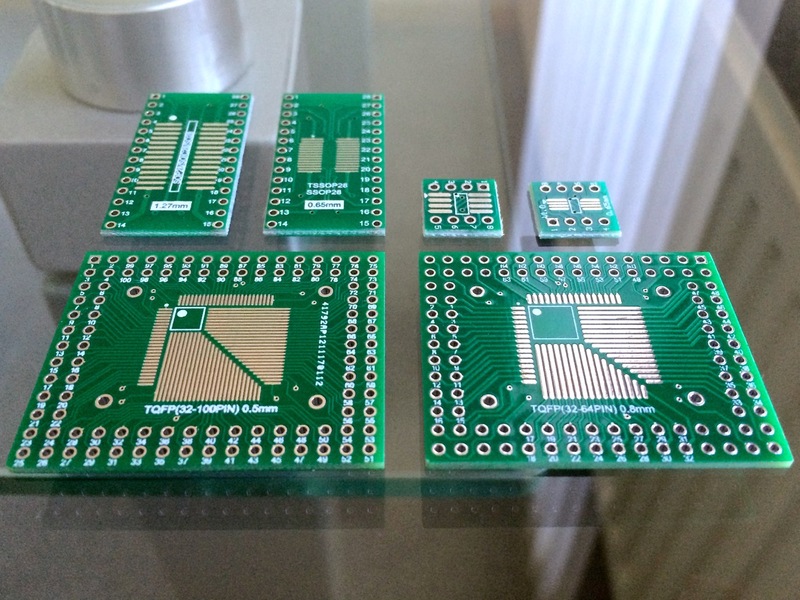 After realizing how easy surface-mount soldering can be with the right equipment (Hakko FX-888D) and tips (Plato SMD flow tip), I got rather excited about all the new components I would now be able to incorporate in my designs. Of course I’ll first have to expand my collection of adapter boards to accommodate the different package types I want to play with. I ordered a set of SO/SSOP and TQFP adapters so I could work with larger SOIC packages, and try my hand at soldering my first quad flat pack ICs, commonly used for more advanced microcontrollers. These versatile boards support up to 28 leads for SO/SSOP packages, and anywhere from 32 to 100 leads on the TQFP adapters. Both board types are double-sided, with different lead spacing on each side. 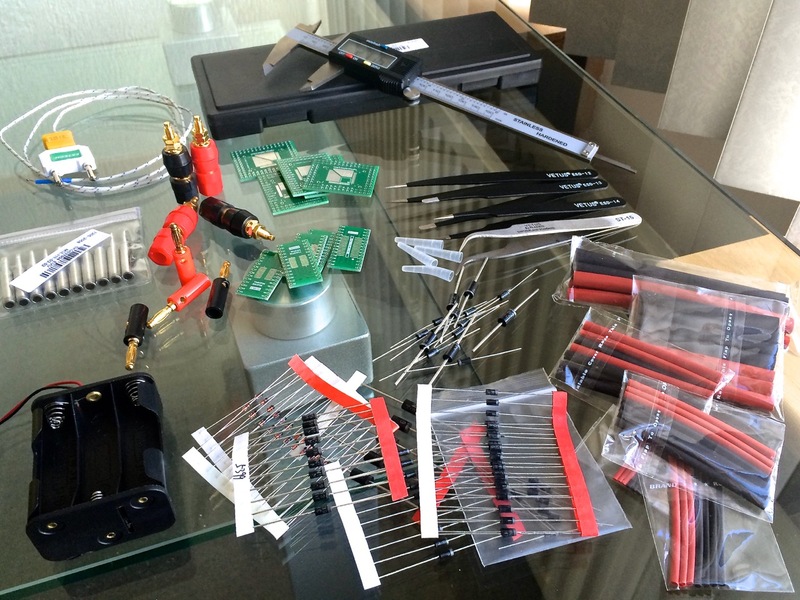 When I ordered my Hakko FX-888D soldering station last year, I also bought a few Hakko and Plato soldering tips. I chose a handful of tips that seemed the most useful to me, but there are many more models available. Instead of wasting more money on name-brand tips I might only use once, or not at all, I decided to expand my tip collection with a set of cheap Chinese ones. This set includes the same hoof and chisel shaped tips I already use, but in different sizes. I probably wouldn’t have bought the two round points if they weren’t part of the set, but for the price I’m paying I’m not complaining. The most interesting tip in the set is a clone of Hakko’s T18-K knife-shaped tip, meant for drag soldering. 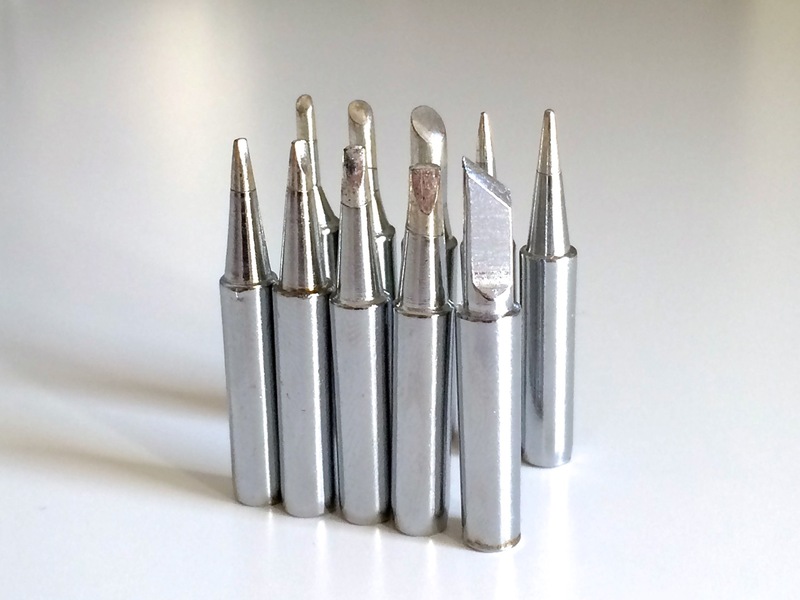 While these tips probably aren’t made to the same high standards as the more expensive Hakko branded ones, they’re good enough to use for practice, to try out different sizes and shapes, or as a backup if one of my regular tips ever cracks. I still haven’t bought or built an adjustable bench power supply, and only recently started my collection of AC-DC adapters scavenged from old electronic devices, so stocking up on some cheap battery holders seems like a good temporary solution. I do have a few USB chargers and cables lying around for regulated 5V DC, but those won’t help me experiment with circuit designs that include their own voltage regulator. 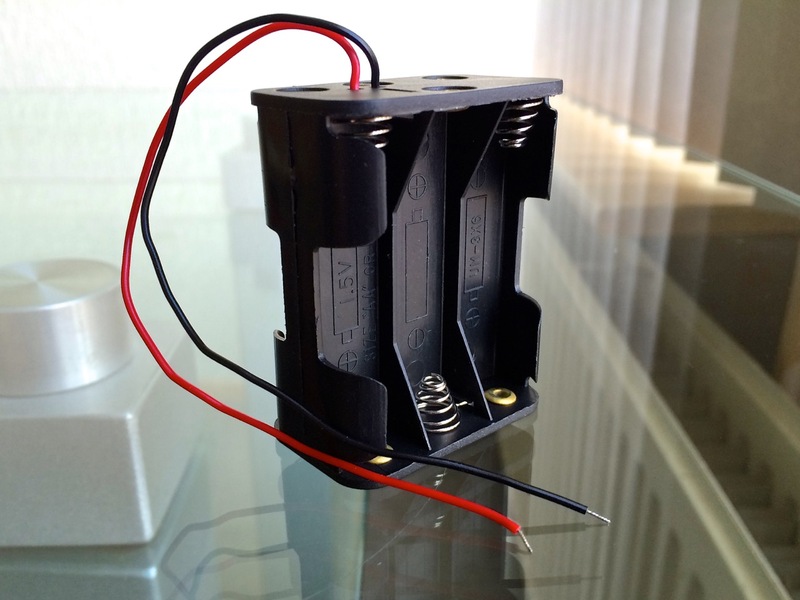 This 6xAA battery holder is perfect in combination with a low-dropout (LDO) 5V voltage regulator, especially when you’re using rechargeable NiMH batteries. The ABS plastic enclosure feels sturdy, with a double-sided design to save some space. You can plug the solid core wires directly into a breadboard, screw them into a DC barrel screw terminal adapter, or permanently solder on a male DC barrel plug. I’ve included links to the 2.1mm DC plug adapters I have lying around at the end of this post. I’m still working on building up my basic parts collection, stocking up on the most commonly used components and accessories, and diodes definitely belong in that category. 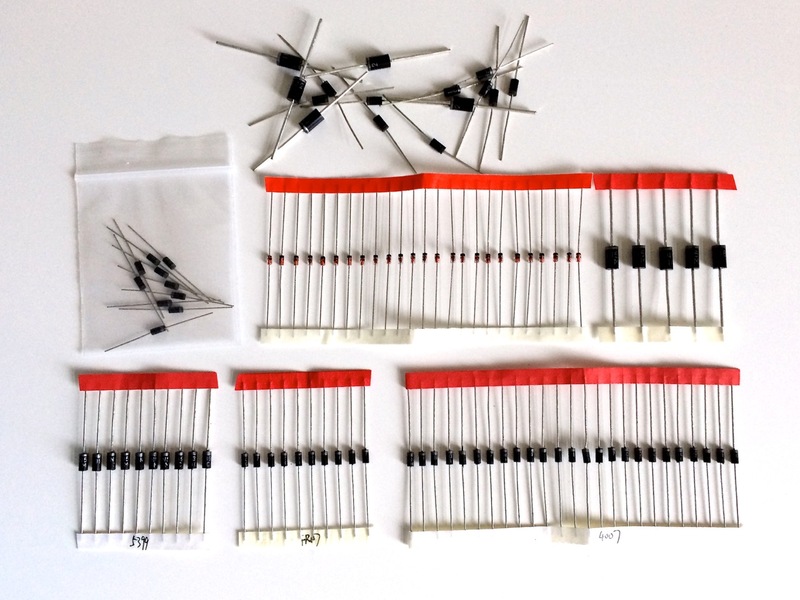 Up until now I’ve only had a handful of 1N4001s, so this diode assortment kit definitely helped fill up some empty drawers in my storage cabinets. The kit consists of a variety of diode types with ratings well above what I’d typically need (1N4007, 1N4148, 1N5399, FR107, FR207, 1N5819, 1N5408, 1N5822). It’s too bad Banggood didn’t add a few Zener diodes, which I would have expected to find in a basic set of common diodes. I’ll just have to include some in my next order from Tayda, where I normally buy my components for hobby projects. I ordered these binding posts and banana plugs both to have some in stock whenever I needed them, and to use them for the variable bench power supply I want to build at some point. Now that I’ve had some time to think it over, the metal screw sticking out of the side of the banana plugs may not be the safest option for something hooked up to a power supply, so I might replace them with something more appropriate. 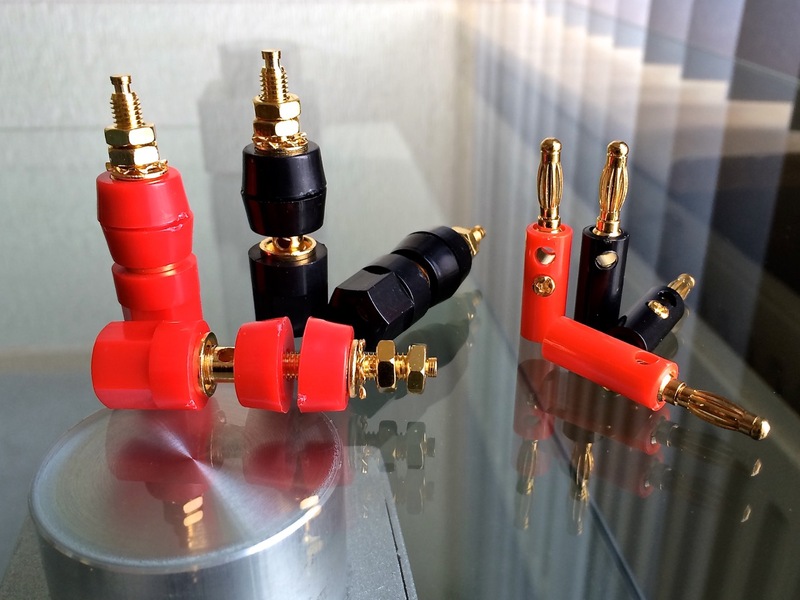 The gold plated, plastic binding posts offer two connection options – either plug in a banana plug in the top part, or hook up bare wires by screwing them into the middle part of the posts. A set of nuts and washers makes it easy to fasten the posts to a project enclosure. The similarly gold plated bananas plugs have a screw to securely hold onto a wire, and a hole in the side to chain multiple banana plugs to the same binding post. Whenever I search around for heat-shrink tubing assortment kits on the usual Chinese websites, I typically come across a range of sizes and colors I’m not even remotely interested in. I’m sure someone out there will have a use for a piece of purple heat-shrink, wide enough to encompass an entire Arduino Nano board, but I’d rather stick to more basic colors, and not have any pieces left over. 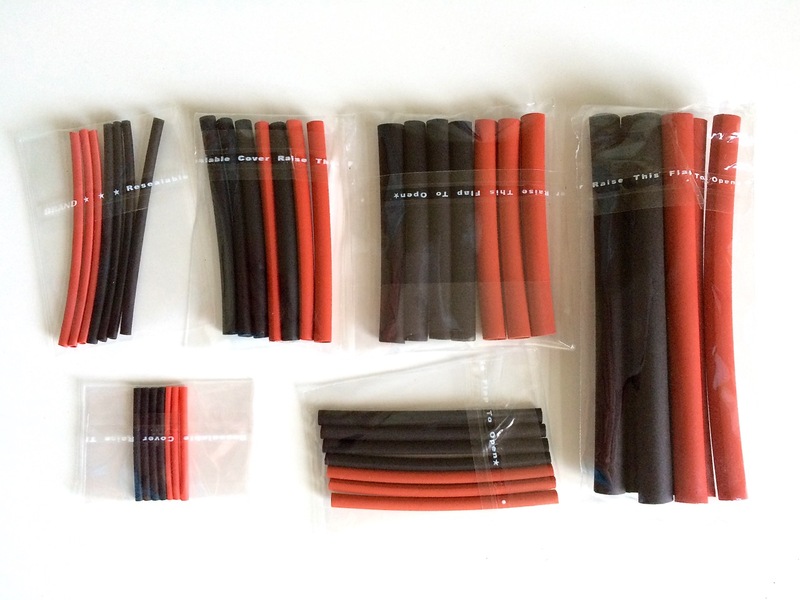 This set of tubes only has black and red pieces, with sizes going up to 6mm (3mm shrunk). That makes them perfect for all my wiring needs, using red for anything with a positive voltage, and black for wiring leading back to ground. When I ordered my Extech EX330 multimeter from Farnell element14 in December, the temperature probe was missing, presumably fallen out of the loose clamshell packaging at some point before it was shipped. After contacting Farnell over the holidays, they sent me a replacement probe with the same specs as the missing part, so I’ve finally had a chance to take a look at the EX330’s temperature sensing feature. The supplied K-type probe only has a range of -20 to 250°C (-4 to 482°F), but the EX330 can actually measure up to 750°C (1382°F), which will come in handy when I buy a new probe and start working on a DIY reflow oven. 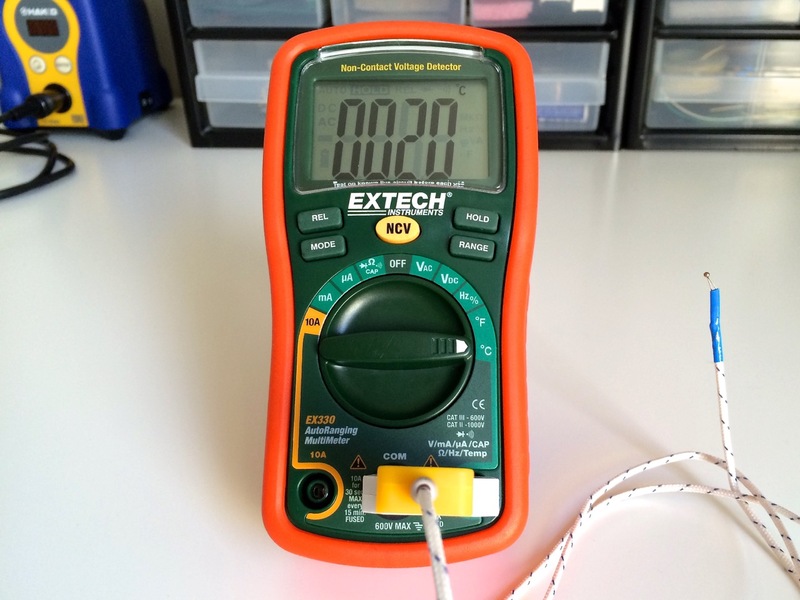 The measurements I took were all accurate, with the multimeter responding fast to changes. Unfortunately, the EX330 only has a resolution of 1°C (1°F), which still meets my requirements, but may be something to keep in mind if you need more accurate measurements.